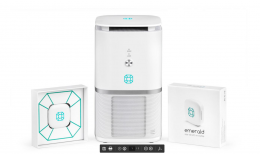 Emerald Air is a first complete air quality system, which monitors and cleans the air to protect people from asthma, allergies and being sick. Emerald Air is a complete solution for cleaner air. The system consists of Emerald and Airadicate (air purifier). It detects all the harmful substances released from finishing materials, but more importantly from human breathing and air conditioning system, which are the sources of bacteria and viruses, that make people sick. What is more important, thanks to UV-C light, Emerald kills viruses and bacteria and filter particulate matter, carcinogenic volatile organic compounds and allergens. It measures temperature for your comfort, humidity to protect you from coughing and pressure to predict when you may feel headache. Emerald Air is connected to the mobile app, which gives you all the data in the real-time. 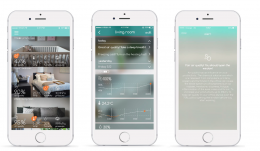 You can check a detailed view of the room to find more information about your air quality which in return lets you know why you may have slept poorly.